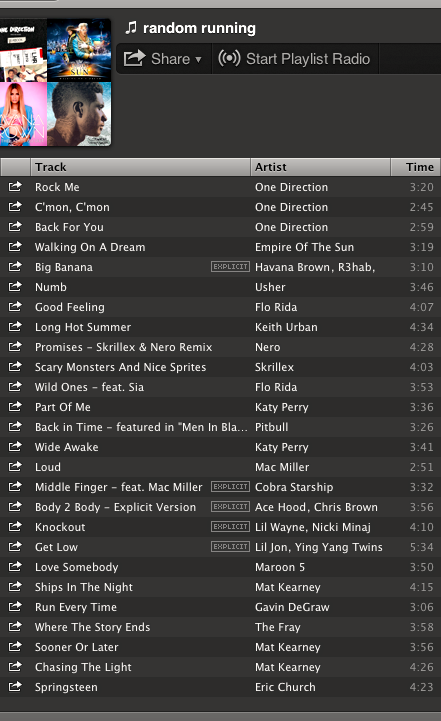 This is probably my most random running playlist… it has everything from One Direction to Eric Church to Maroon 5 to Lil Wayne and Mac Miller. It is made up of 26 songs, so it’s good for a reasonably lengthy workout. The reason why I like this playlist so much is it has enough songs to pump me up and get me mad and in the zone, although it is complemented by some songs that make me think. I like reflecting and thinking during runs, and this playlist is perfect for this. Click the picture below and enjoy!